What rocks my socks? My socks! I present the brilliant Ravenclaw socks! Eat your heart out, Gryffindors, Hufflepuffs, Slytherins, and fellow Ravenclaws! They're mine, all mine! Muahahahaha! 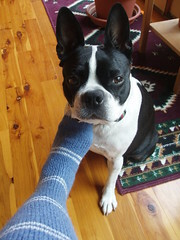 Of course, Virginia couldn't understand why I would be taking photos of inanimate socks, when there was a very animate Boston terrier who would happily be my model. So she took it upon herself to get into the action. In other news, my dramatic reading of Vonda N. McIntyre's "A Modest Proposal" is available on today's StarShipSofa podcast here and via iTunes. My narration starts about 3.5 minutes into the podcast. I've also updated my website with a list of and links to my podcasting activities. Awesome! (But they're THE WRONG COLOR.) GOHUFFLEPUFFYAY!!!! ROFLOL! You need some mighty Hufflepuff socks, definitely. Oh wow, they're so cute! I'm trying to convince my mom to knit me a Ravenclaw hat, but she refuses ::pouts:: maybe I'll show her your socks and she'll come around. Gotta go plot stuff now. Eeee! Aw! I hope my pictures help to convince her. If you get the Ravenclaw hat, please share photos! Go Ravenclaws! You...you're funny! You're dog's funny too. Those are some nice looking socks. I'm ridiculously thrilled with the socks. LOL! Thanks. frightened totally outdid herself. I love them! Thanks so much! frightened deserves all the credit. I'm Jealous. Those are really nifty socks. Thanks for the kind words. frightened knits awesome socks! Aw, thanks! :) frightened deserves all the credit. I'm loving them. Those are truly some rockin' socks!! Thanks! :) frightened outdid herself. I just love them. Those are just fabu socks! How cute and cozy looking. And as always Virginia steals the show. Give her a doggie smootch for me. Aw, thank you! I'm just amazed by creative people like frightened and you who can make such beautiful things to wear. Very cool socks. I can't tell from the angle of the photo -- are they over-the-knee socks? How high up do they go? Thanks! frightened is an artist. They are over-the-knee; they end right above my knee, in fact. frightened knitted them for me; she offered her knitting skills during the last Sweet Charity auction, and I won. Aren't they awesome? You do need some Slytherin socks. Hey - I have a Slytherin tie, so does that make us house buddies? But of course she couldn't - very logical are dogs. And they do so like to be involved. Aw, thank you! :) frightened does absolutely gorgeous work!